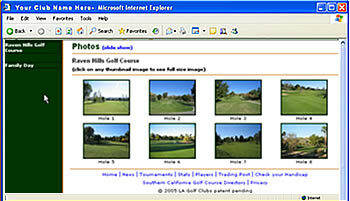 Players see a thumbnail screen shot of photos, categorized by events (i.e., tournaments, banquets, etc.) which they can click on to see a full scale image. Players can also watch a full event's photos as a slide show if they so choose. All a club administrator has to do to create a photo event section is give it a name and then simply upload the pictures. LAGOLFCLUBS.com does the rest. It creates the thumbnail images, the large formatted image and the slide show. It's that simple. The officers and directors page will show all the officers and directors of your club including titles, contact information and photo (if one is available). Contact information on this page will appear exactly as it does on the officers/directors player profile page where they control the information they want to show or not show. Additionally, your club can show only officers, only directors or both if that is how your club is organized. They can be placed in any order on this page. Players can look up basic club contact information (phone, email, etc.). Your club membership can change this page at any time and like the player profile page, they can decide to show as much or as little information as they choose (i.e., phone, address, email, etc.). This is also where new members can sign-up and pay for their membership online. There is an application page to which club administrators can add detailed instructions directing new members how to join their club. This includes going through a complete process of filling out the form and then paying for their membership. No checks, no papers to fill out for your club directors. Members can view your President's, Tournament Director's, or any other club officer’s message to their members online. The messages can contain special text, photos, be formatted anyway your club administrators decide (using tables, colors, etc.) and display a date when the message was last updated. There is a group of standard news sections like your President's Message, Tournament Director's Message, Financial Director's Message etc. but club administrators can create as many additional custom messages as they like. Club players can have a special login access where they can edit and maintain any custom message they are in control of (i.e., Like "Joe Wilson's USGA Rule of the Week" where player Joe Wilson maintains his own news section). Also your club president and other board members can update and edit their own messages at any time. Additionally, the links to either standard or custom messages can be modified to appear in any prioritized order in the news section. These messages can also be added to the home page, clicked to show or not show at any time (i.e., seasonal messages, etc.) or be deleted entirely. Club administrators have complete control of how their news section is ordered, formatted and what news is shown or not shown at any time.